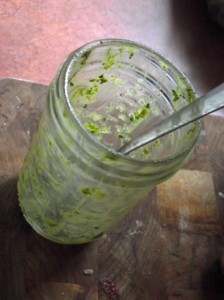 Luckily for me, my sister-in-law’s garden has been overrun with copious amounts of fragrant green cilantro, and even better for me is that she opted to make a couple of batches of cilantro pesto with it. I’m not the least bit embarrassed to say that I sat down with the jar and ate half of it with a spoon before I even began thinking about using it in a pasta or flat bread. I’ve already posted a recipe for a basil pesto, however, this is a really light and refreshing twist on the pesto that we all already know and love! Strip leaves from stems and set aside. Rough chop stems and add to food processor (or blender) will all other ingredients EXCEPT leaves and blend until smooth. Add leaves and blend until leaves are coarsely chopped & well mixed into pesto sauce. This recipe freezes very well if you find yourself with an overabundance of fresh cilantro. in the recipe you call for a 1/2 what of fresh grated Parmesan cheese & olive oil? I’m assuming 1/2 cups but I quit assuming in recipes long ago. Hi Jay! I’ve fixed the typo & yes- you assume correctly! 1/2 cup olive oil. Let me know how it turns out! ps- Besides in pasta, it’s awesome on fresh bread with cheese.